← 5 Reasons why your customers don’t believe you? Companies highly focused on customers are always paying attention to what is going on in their lives. Here is a great simple example from Wholefoods. 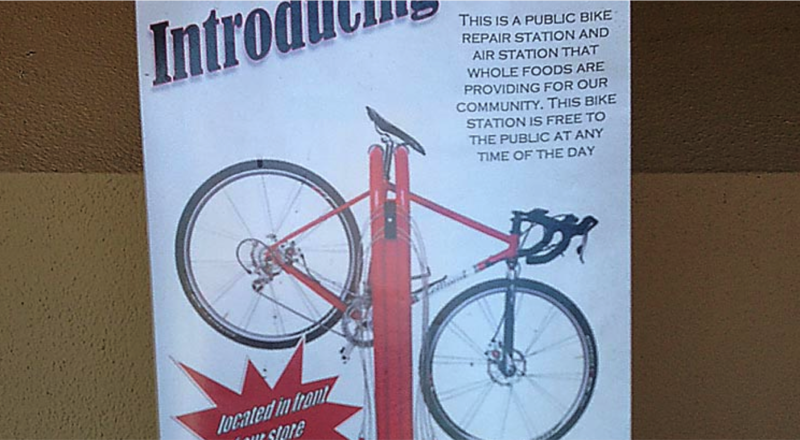 After seeing an increasing number of shoppers coming to the store on bikes the local store manager decided to install a bike fix it stand. The stand provides a range of tools and amenities that cyclists can use to tune up or service their bikes while visiting the store. From a business point of view, Wholefoods are adding value to their cycling shoppers experience. Will this positively influence these customers to choose whole foods over other supermarket options? Time will tell. The message this action sends however is very powerful, it demonstrates Wholefoods is committed to its customers. It is willing to invest in helping make customer’s lives easier without an obvious return. How do you show you are paying attention to your customers? This entry was posted in Customer Centric Culture, Customer Experience, Customer Insight, Customer Value, Customer-Centricity, Uncategorized and tagged wholefoods;customer culture;customer insight;customer centricity. Bookmark the permalink.